Preheat oven to 180°C (350°F). Line a lightly greased 9cm x 24cm loaf tin with non-stick baking paper and set aside. Place the honey, sugar, butter and vanilla in a medium saucepan over medium heat. Cook for 5–6 minutes or until sugar has dissolved and the mixture has reduced slightly. Remove from heat and set aside for 5 minutes to cool slightly. Add the bicarbonate of soda and whisk to combine. Place the eggs in a jug and whisk well. Gradually add the eggs to the honey mixture, whisking constantly until well combined. Add the flour and stir to combine. Divide the dough in half. Roll out each half between 2 sheets of lightly floured non-stick baking paper to a 3mm-thick 30cm x 40cm rectangle. Place on 2 large baking trays and cook for 10–12 minutes or until golden brown. Using the base of the loaf tin as a guide, cut six 9cm x 24cm rectangles from the baked dough. Allow to cool completely. Place the cream cheese, sour cream, icing sugar and honey in a large bowl. Using hand-held beaters, beat until well combined and thick. Place 1 cup of the icing in the base of the tin and spread to an even layer. Top with 1 of the biscuits. Top with a further ¾ cup of the icing and spread evenly. Repeat with remaining biscuits and icing, ending on a biscuit layer. Refrigerate for 6 hours or until firm. Turn out onto a plate and remove the tin. 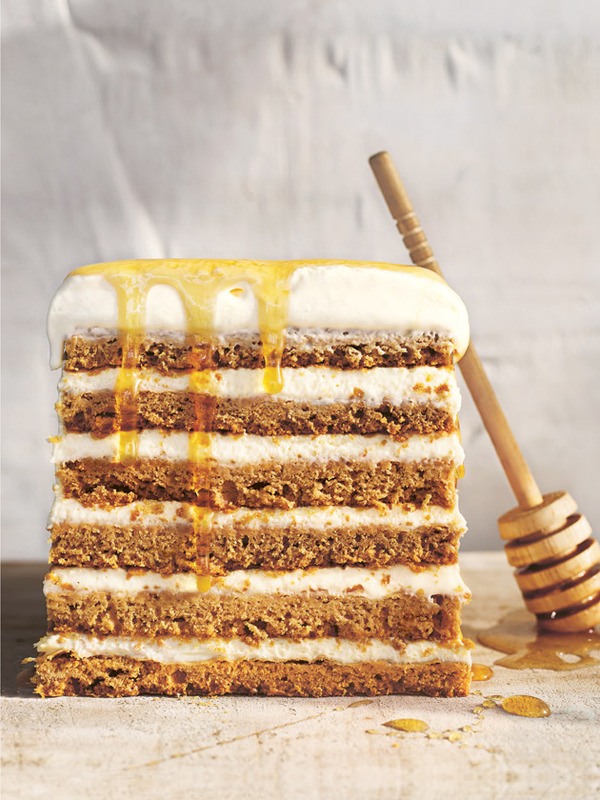 Cut into slices and drizzle with extra honey to serve. Serves 8–10.